Born: 27 February 1860, Nijmegen, Netherlands. Died: 26 March 1942, Wassenaar, Netherlands. G.A.F. Molengraaff (affectionately known as "Moley" among his South African colleagues) came from an aristocratic Dutch family which had lived in the province Brabant since the fourteenth century. He received his schooling in Nijmegen and then studied mathematics and physics at the University of Leiden until 1882. Proceeding to the University of Utrecht he continued his studies in geology and natural history until 1886. He then set out for the West Indies, where he studied the geology of the volcanic island St Eustatius (one of the Leeward Islands, then under Dutch control). This work formed the basis of his doctoral dissertation, De geologie van het eiland St Eustatius, submitted at Utrect and published in Leiden later in 1886. After spending a semester in Munich he returned to the Netherlands in 1888 to become a lecturer in geology at the University of Amsterdam, and was promoted to professor in 1891. In March 1887 he married Cornelia Gerlings. with whom he had two children. He was fluent in several languages and in the course of his career published in Dutch, German, English and French. 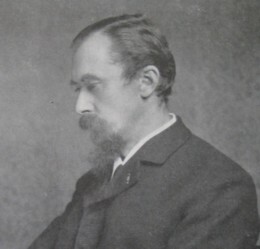 Molengraaff first visited South Africa for two months in 1890 to study the recently developed goldfields of the Witwatersrand, including the areas around Heidelberg and Klerksdorp. He also visited the Vredefort Dome - the hilly region to the north-west of Vredefort and Parys where a thick ring of strata are upturned around a central core of granite. Upon his return to the Netherlands he published a comprehensive review of the geology of the South African Republic (Transvaal), "Schets van de bodemgesteldheid van de Zuid-Afrikaansche Republiek...", in the Tijdschrift van het Koninklijk Nederlandsch Aardrijkskundig Genootschap (1890). This was followed by several other papers, including "Beitraege zur Geologie der Umgebung der Goldfelder auf dem Hoogeveld in der Suedafrikanischen Republiek" (Zeitschrift fuer Praktische Geologie, 1894). He confirmed the broad classification of the strata and the overall structure of the region as proposed earlier by A. Schenk*, but regarded the gold-bearing strata and the successive volcanic and sedimentary rocks as a separate unit which he named the Highveld formation - a term which he later discarded. In 1893 Molengraaff travelled to the Dutch East Indies (now part of Indonesia) as geologist to the Borneo Expedition. His detailed final report, with excellent geological maps, provided an authoritative account of the geological structure of the island. It was published as Geologische verkenningstochten in centraal-Borneo, 1893-1894 (Leiden, 1900). An English translation, Geological explorations in central Borneo, was published in Leiden in 1902. Meanwhile Molengraaff had been appointed to the new position of government geologist of the South African Republic in 1897. He assumed duty in September and soon became a citizen of the republic. His post included the directorship of the newly created Geological Survey and part of his brief was to collect rocks and minerals for its geological museum. Travelling in a specially equipped covered ox-wagon he made many excursions throughout the territory to familiarise himself with its geology before undertaking more detailed surveys. The work was reported in his annual reports for 1897 and 1898, but was interrupted by the outbreak of the Anglo-Boer War in October 1899. In his first report, which was published also in the Transactions of the Geological Society of South Africa (1898, Vol. 4(6), pp. 119-147), he gave a preliminary account of the succession of rocks in the southern half of the territory, including a review of earlier work by others. The next year he reported further on the stratigraphy of the territory, and in more detail on the geology of the districts Vryheid and Waterberg. These two reports were his most important contribution to South African geology. He summarised his findings in a comprehensive paper, "Geologie de la Republique Sud-Africaine du Transvaal" in the Bulletin de la Societe Geologique de France in 1901. An English translation, with some additions and corrections, was published in the form of a 90 page monograph, Geology of the Transvaal in 1904. He also published a Geological sketch map of the Transvaal. Topography and geology... (1:500 000, Johannesburg, 1902), with explanatory notes, and contributed a paper on "The glacial origin of the Dwyka Conglomerate" to the Transactions of the Geological Society of South Africa (1898, Vol. 4(5), pp. 103-115). He regarded the Witwatersrand Supergroup as part of a Primary System which included the basement granites; recognised the Ventersdorp Supergroup as a separate unit which he named the Vaal River System; was first to recognize and describe the Bushveld Complex as a geological unit which he named the Bushveld Plutonic Series; named the Waterberg Sandstone Formation (now the Waterberg Group), first recorded by H.S. Harger* in 1898; and introduced the name Transvaal System for what he had previously called the Cape System, including the rocks of the Transvaal Sequence, the Bushveld Complex, and the Waterberg Group. He found that an extended period of folding and denudation preceded the deposition of the rocks of the Karoo Supergroup in the Transvaal, and accepted that the coal of the Transvaal and Natal was older than that of the Stormberg range in the Eastern Cape. He also concluded that the granite masses at Vredefort and between Pretoria and Johannesburg were older than the Bushveld granite and therefore probably not intrusive in the Witwatersrand Supergroup as he had originally thought. His book was the first to deal comprehensively with the geology of the territory. During the early part of the war Molengraaff was instrumental in establishing the Identity Department of the Transvaal Branch of the Red Cross society, which handled the exchange of information about prisoners and casualties. He introduced the practice, still in use today, of providing soldiers with identity discs. After resigning his post he returned to Holland to join his family. During 1901 he visited the island Sulawesi, Indonesia, to investigate an occurrence of gold at Sumalata, on the north shore of the island. In the latter half of 1902 he returned to South Africa and settled in Johannesburg as a consulting geologist until the end of 1905. During these years he contributed various papers and notes on the geology of the Transvaal to the Transactions of the Geological Society of South Africa. He served as vice-president of the society in 1897 and again in 1902, and as president in 1903. His presidential address dealt with the Vredefort Mountain Land. After leaving South Africa he was elected an honorary member of the society, and later received its Draper memorial medal (1938). In 1898 Molengraaff became a member of the South African Philosophical Society and remained a member after it became the Royal Society of South Africa in 1908. He also joined the South African Association for the Advancement of Science and in 1904 served on its committee for Section B (which included geology). By 1899 he was an associate of the Chemical and Metallurgical Society of South Africa. From 1897/8 to 1900 he was an examiner in geology for the University of the Cape of Good Hope. Molengraaff returned to Holland to become professor of geology at the Technische Hoogeschool (Technical University) in Delft in 1906. Here he played an influential role in the training of mining engineers. His lectures were fascinating and were supported by carefully planned and well-conducted field trips. As an efficient organiser he served on many advisory bodies and played an important role in establishing the Instituut voor Mijnbouw (Mining Institute) in Delft. At the eleventh International Geological Congress held in Stockholm, Sweden, in 1910 he delivered a paper, "On the deposits of iron ore in the Transvaal". During 1910-1911 Molengraaff visited Indonesia again, as leader of the Netherlands Timor Expedition. His work there provided insights into the geology and tectonics of the East Indian Archipelago and led to many useful papers and discussions, while the rocks and minerals he collected formed an important addition to the collections of the Instituut voor Mijnbouw. His main geological interest was to relate his research on volcanism and mountain building to a theory about the structure of the earth as a whole. Some of his conclusions pertained to recent movements of the earth's crust and their effects on the geological history of Indonesia (1912). With H.A. Brouwer* and others he published a detailed account of the geology of the island Letti (just east of Timor) in 1915. Other papers dealt with the coral reefs of the region, the deep sea and its deposits, including manganese nodules, and his contributions to the theory of continental drift. He also published an account of the Timor expedition's work, Nederlandsche Timor-expeditie, 1910-1912 from 1915 onward. Meanwhile a new mineral found in rocks from the Transvaal had been named Molengraaffit in his honour, by Brouwer in 1911. Early in 1922 he again arrived in South Africa as leader of the Shaler Memorial Expedition, accompanied by three American colleagues, R.A. Daly, C. Palache and F.E. Wright. Their main objective was to study the Bushveld Complex. With the help of A.L. Hall*, who had already mapped large parts of the complex, they studied and interpreted its structure and history. The work resulted in an important paper by Daly and Molengraaff, "Structural relations of the Bushveld igneous complex, Transvaal" in the Journal of Geology (1924). At the conclusion of their work in the Bushveld, Molengraaff revisited the Vredefort Dome. In colleboration with Hall, and with the help of the detailed field work of Dr L.T. Nel, he made a thorough study of its tectonic problems. The resulting monograph by Hall and Molengraaff, The Vredefort Mountain Land in the southern Transvaal and the northern Orange Free State, was published in Amsterdam in 1925 and for decades remained the standard work on this structure. Molengraaff visited South Africa for the last time in 1929, as guest of the South African Association for the Advancement of Science which met jointly with the British Association that year. He also attended the 15th International Geological Congress in South Africa in 1929. On this occasion the University of the Witwatersrand conferred an honorary Doctor of Science (DSc) degree on him in recognition of his contributions to South African geology. After his retirement in 1930 he moved to Wassenaar, where he named his house Vredefort. He was elected a Fellow of the Geological Society of America in 1913, was a member of the Royal Academy of Sciences of Amsterdam, the Deutsche Akademie der Naturforscher, the Royal Academy of Sciences of Belgium, the American Academy of Arts and Sciences, and an honorary member or correspondent of a number of other scientific societies in several countries. He received the Borneo medal of the Netherlands Science Congress (1897), the Plancius medal of the Royal Netherlands Geographical Society (1930), and the Wollaston medal of the Geological Society of London (1936), and was honoured as a Knight of the Order of the Netherlands Lion (1901) and a Commander of the Order of Orange-Nassau (1936). Anhaeusser, C.R. (ed.) A century of geological endeavour in southern Africa, 1895-1995 (pp. 15, 26, 114-117). Johannesburg: Geological Society of South Africa, 1997. Arthur Lewis Hall, 1872-1955. Biographical Memoirs of Fellows of the Royal Society, 1956, Vol. 2, pp. 139-148. Chemical, Metallurgical (and Mining) Society of South Africa. Proceedings, 1897-1903, Vol. 2-3: Lists of members and associates. Dixon, R.D. The museum of the Geological Survey, 1897-1992. In N.J. Dippenaar (ed. ), Staatsmuseum 100 (pp. 56-77). Pretoria: National Cultural History Museum, 1992. Draper, D. The appointment of a State Geologist. Transactions of the Geological Society of South Africa, 1897, Vol. 2, p. 37. Geological Society of South Africa. Proceedings, 1915, Vol. 18, p. xiii-xix and 1920, Vol. 23, p. xii-xvi: Lists of members; Transactions, 1898-1899, Vol. 4-5. Google scholar. http://scholar.google.co.za Publications by G.A.F. Molengraaff. Molengraff, G.A.F. Geology of the Transvaal. Edinburgh and Johannesburg: Constable, 1904. National Automated Archival Information Retrieval System (NAAIRS). http://www.national.archives.gov.za/naairs.htm Documents relating to Molengraaff. Obituary notices: Gustaaf Adolf Frederick Molengraaff. Quarterly Journal of the Geological Society of London, 1943, Vol. 99, pp. lxxvii-lxxviii. Shand, S.J. Memorial to Gustaaf Adolf Frederik Molengraaff. Proceedings Volume of the Geological Society of America, 1943, pp. 205-207. South African Association for the Advancement of Science. Report, 1904, 1905/6: lists of members and office bearers. South African Committee for Stratigraphy. Stratigraphy of South Africa. Part 1: Lithostratigraphy...(pp. 95, 191, 335). Pretoria: Geological Survey, Handbook 8, 1980.